An itinerary that combines two of Latin America’s most iconic destinations: Machu Picchu and the Galapagos Islands. From sandy sunbathing sea lions to dancing Blue Footed boobies, and colorful Sally Lightfoot crabs scrambling over volcanic rocks, the Galapagos is a sight to behold. No reviews yet for this trip. Browse other reviews below for Andean Discovery. Upon arrival in Lima this evening, a member of our staff will transfer you to your hotel, just steps away from the airport. Enjoy dinner on your own this evening. Note: The listed hotels are 4/5 star. Please contact us for information on 3 star options. The capital of the Inca Empire awaits! This morning, Andean Discovery staff will assist with your check-in for the spectacular one-hour flight over the Andes Mountains to Cusco. Upon arrival, you’ll be met by your Andean Discovery guide and descend into the Sacred Valley of the Incas. Extending from Cusco to the intriguing 15th-century city of Machu Picchu and surrounded by the Andes, the Sacred Valley is home to archeological sites and small towns alike. Prepare to experience this balance of what was and what is—ancient civilization and modern life. The first stop is Chinchero, known for its colorful weaving traditions. Visit with a family that has been practicing traditional weaving techniques for generations and learn about the importance of weaving in Andean cultures. After lunch, continue on to the agricultural terraces of Moray, a sophisticated biological laboratory of the Incas. A series of circular terraces, resembling sunken amphitheaters, create a variety of climatic conditions. The lowest level of each agricultural complex is the warmest and you’ll actually feel the temperature rise as you descend. This ingenious technology allowed the Incas to conduct crop experiments and adapt plants to a variety of climates. After a short drive in the Sacred Valley, you’ll check in to your room at an Andean paradise with fragrant gardens and mountain views. Experience one of the world’s great train rides, with stunning views of the Urubamba river gorge, on your way to Machu Picchu. Upon arrival in the town of Aguas Calientes, you will be greeted by staff from your luxurious eco-lodge. This afternoon choose from several activities at the lodge, including a nature walk in the orchid pavilion, natural sweat lodge-sauna, bird observation, or relax on your own. An additional visit to the Machu Picchu ruins can be scheduled for this afternoon if desired. This evening enjoy dinner at the lodge. This morning take a short bus ride to the sacred ruins of Machu Picchu for a private tour. Explore the Temple of the Sun, the Royal Tomb, ceremonial fountains and baths, and the Sacred Plazas. Opt for an exhilarating one-hour hike up the steep trail to the summit of Huayna Picchu for a breath-taking bird’s-eye view of Machu Picchu. (Tickets must be purchased in advance.) After your visit, transfer to Aguas Calientes for lunch and board the train for Ollantaytambo where you will be met by your driver and transferred to Cusco. This evening enjoy dinner on your own at one of Cusco’s many fine restaurants. Travel by foot and private vehicle during a city tour that takes you down Cusco’s cobbled streets and narrow passageways with brightly painted balconies overhead. Visit the historic Plaza de Armas, the Coricancha, the Inca’s Sun Temple, the Incan fortress of Sacsayhuaman, and the ceremonial pools of Tambo Machay. Enjoy lunch and dinner on your own. Fly to Lima and then Quito, Ecuador. At 9,350 feet above sea level, Quito is the second highest capital city in Latin America. Despite the fact that it’s only 15 miles south of the equator, Quito’s elevation gives it a wonderful spring-like climate year-round. Upon arrival, you will be met by our staff and transferred to the hotel. Lunch and dinner are on your own. Explore colonial Quito’s cobbled streets, whitewashed adobe walls, and ornate balconies during a private tour. After lunch, transfer to the Middle of the World monument, zero degrees latitude, where you can straddle the equator. This evening enjoy dinner on your own. Fly to Baltra Island, Galapagos, and board the Santa Cruz in time for lunch and a welcome briefing. This afternoon visit Las Bachas beach, an important nesting area for the east Pacific green sea turtle. Look for wading birds, stilts, and flamingos at several brackish lagoons. This morning explore the impressive cliffs of Buccaneer’s Cove, which is home to a large number of marine birds, sea lions, and inter-tidal organisms. Enjoy fantastic natural formations such as “Elephant Rock”, “The Bishop”, and an impressive natural cave. 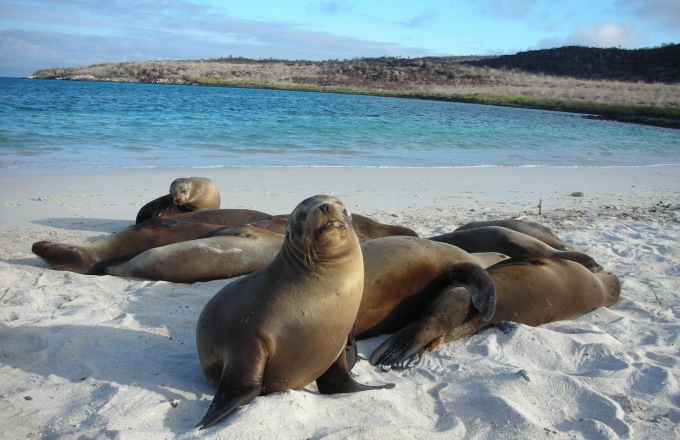 This afternoon explore Puerto Egas in search of land and marine birds along with Fur Sea Lions. At low tide, marine iguanas graze upon the algae beds. Take to the water for snorkeling before climbing aboard in time for dinner. Begin the day at Rabida Island’s red-colored beach, a result of the unusually high content of iron in the volcanic material. A large colony of sea lions is found here, as well as mockingbirds, yellow warblers, and several species of Darwin’s finches. Snorkel from the beach or opt for a ride in the glass bottom boat. As the Santa Cruz motors to the next destination, keep an eye out for dolphins. This afternoon hike to Bartolome’s summit for fantastic views of the archipelago. Then climb aboard a panga for a ride around the colossal Pinnacle Rock followed by snorkeling. Keep an eye out for Galapagos Penguins, which are often found here. The morning begins with a panga ride along the dramatic cliffs of Genovesa Island. Disembark and climb a steep staircase to a flat plateau where you will find yourself surrounded by birds unbothered by your presence. Observe large colonies of Nazca Boobies, Red-footed Boobies, Great Frigate birds, and storm petrels. Those not wishing to disembark can enjoy a longer panga ride along the cliffs. Then take to the water for a chance to see hammerhead sharks and a variety of tropical fish. This afternoon snorkel in Darwin Bay and then take an easy stroll to observe hundreds of birds: frigates, Red-footed Boobies, Nazca Boobies, gulls, herons, finches, and mockingbirds among them. After breakfast you may opt to visit Cerro Colorado to learn about the giant tortoise breeding program. Return to town and transfer to the airport for your flight back to Quito. Lunch and dinner today are on your own. Conveniently located within Jorge Chavez International Airport, the Lima Airport Wyndham Hotel offers guests first class accommodations and services. Hotel amenities include a 24-hour spa, complimentary Wi-Fi, 24-hour restaurant, bar, and indoor pool. The spacious and modern rooms include cable television, air conditioning, heating, safe deposit box, mini-bar and hair dryer. Sol & Luna Lodge and Spa is found within the Urubamba Valley's stunning scenery. Flowers bloom year-round and 35 species of birds call the area home. Sol & Luna's owners are committed to keeping in harmony with the natural environment. Guests's bungalows are made from materials found in the valley: adobe brick, logs, and stones. Each room features a marble-tiled bathroom with all the accessories required for maximum comfort, a terrace with a view of the gardens, complimentary Wi-Fi, a digital safety deposit box, and 24-hour room service. The property includes a horse ranch, high quality lounge bar, and dining room. Inkaterra Machu Picchu is an intimate 85-cottage luxury hotel tucked within 12 secluded acres of cloud forest. Waterfalls and streams gently cascade through acres of orchids, and multiple species of hummingbirds whiz around the property. Guests follow stone pathways to their rooms, located in comfortable one- or two-story whitewashed casitas. The hotel offers nature activities, spa services, a working tea plantation, and a dining room and bar. Decorated with local crafts and eucalyptus beams, every room offers a fireplace, spa-style bathroom, colonial style wardrobe, Andean slippers crafted from recycled materials, and a complete set of environmentally-friendly toiletries. Complimentary satellite internet is available to guests. The Costa del Sol Hotel Picoaga is located in a charming colonial-era mansion in Cusco. The building dates back to the 17th-century when Marquis Picoaga had it built for himself. The mansion is split into a colonial wing and a more modern wing and all rooms are equipped with cable TV, heating, safe, Wi-Fi, mini-bar, hair dryer and a clock radio. The hotel's restaurant, El Mirador, features a menu mixed with delicious Peruvian and International cuisine. There is also a bar and lounge area that includes a large fireplace and an impressive view of the cathedral, which is lit up at night. The Mercure Quito is located in the lively Mariscal district near shops and restaurants. Each of the hotel's 147 large and modern rooms features Wi-Fi, safe deposit box, mini-bar, bathrobe, and slippers. Hotel amenities include a fitness center, restaurant, and bar. The Santa Cruz has gained worldwide recognition for its superb service, expert crew, knowledgeable multilingual guides, and menus that feature the very best international cuisine and celebrated Ecuadorian dishes. With 48 cabins of varying sizes and configurations, the Santa Cruz's highly-experienced crew and staff are dedicated to making sure your holiday in the enchanted isles is enjoyable, comfortable, and fun from start to finish. The ship features fine dining, ample social areas, a sundeck with a bar, dance floor, sun loungers, a Jacuzzi, a well-stocked library, and the latest in navigation and safety systems. Choose from suites, double, or single cabins, all with private facilities.